You made a 75 year old man cry with happiness... His wife of 36 years died of cancer 16 years ago and he was able to watch her move again as they danced on screen. Thank you so much. Our video professionals will clean and convert your family's old super 8, 8mm and 16mm film movies into clean and restored, easy to view digital videos. Our process is a true frame-by-frame transfer which scans each individual frame of film one-by-one using a progressive scan capture system. Our experts then manually color and exposure correct each scene at no extra charge. You can take your digitized footage as an uncompressed AVI or MOV file on a hard drive for editing at home or we can master a DVD for you that will play on your DVD player. Once your reels are digitized, enhanced and cleaned up by our editors, we put your video clips on our website so you can view and rearrange the clips and label them with captions. New! Create digital photos from your video right inside our online video editing system. It's free with your order! The link to view your clips is private to you but you can share it with your friends and family if you like. As soon as you're done organizing and labeling the clips we burn you a full set of DVDs with menus. Your captions become the DVD chapters on the DVD menu. DVDs are just $8 each. See our video editing system's online help to understand how it all works. The DVD editing and arranging is, of course, only applicable to the DVD service. 1080p capture is delivered on a hard drive which you can edit using your favorite software. Your film is captured frame-by-frame as each frame passes through a projector with an enlarged gate with a specialized LED light source in front of a half-inch 3CCD progressive scan camera. The enlarged gate allows us to capture the entirety of the frame. As each frame passes through the projection gate, a picture is taken. These individual frames are put into specialized software that converts the frames into a movie, resulting in a solid, smooth, flicker-free capture. This process produces a higher-quality transfer and you will not lose anything from your original film. Each reel is individually cleaned and lubricated with Edwal Anti Static Film Cleaner. The film passes under a microfiber cloth that removes dust and debris that may have built up over the years. This helps keep the film hydrated and pliable while also filling in small scratches and giving the film a light protective coating. It makes your movies cleaner and brighter! During this process, we inspect the film, add leader if necessary, and repair tears or bad splices. Also, at no extra cost we will combine up to 8 small 50ft reels together onto one large 400ft archival reel(s) for more compact and safe storage. See our Movie Film Transfer FAQs for more information! Please Note: Not all films will benefit equally from color correction. Unlike super bright projector bulbs that tend to blow out a picture, our specialized LED light source provides a softer and more realistic light. We also have the ability to control the brightness of each scene during capture of your film so that your darker scenes are brighter and your brighter scenes aren't blown out. Our LED light source puts out much less heat than a projector bulb to eliminate the chance of film burn or hot spots on the movie. See our Movie Film Transfer FAQs for more information! Unlike an automated setup, we monitor your film as it is captured to be sure no dust or hairs get into the transfer. We watch the transfer on an LCD TV Monitor and keep clean, compressed air ready in case any debris gets into the film gate. This is a huge advantage over non frame-by-frame methods! We then take your film into our professional editing consoles and convert your captured film to play at its original speed on your TV or computer. We will remove all of the blank footage. You are not charged for any of the blank footage. See our Movie Film Transfer FAQs for more information! NOTES: Each DVD is an additional $8. About 20 reels of 50' film will fit on each DVD at 480i Resolution. Although most home movie film is silent, we can transfer sound for an additional 25¢ per foot. 1080p requires the purchase of a Hard Drive or Flash Drive from us. See our Movie Reel Transfer FAQ for more information. DigMyPics is the leader in a broad base of personal digital archiving technologies. No other company offers the breadth of expertise, experience, offerings and technology to help you preserve your personal archives. We do all the work from our sole location in Gilbert, Arizona, so you can feel good about supporting the American artists that work at DigMyPics! See our Movie Reel Transfer FAQs for more information! Want To Edit Your Digital Movies At Home? Did you know you can also get your movie reels in an editable file format? We will transfer full quality uncompressed .avi or Quicktime .mov files from your 8mm and Super8 reels to a 500 GB USB 2.0 External Hard Drive! This hard drive does not require a "wall plug" to power it up. You only need your computer and the USB cable that comes with it. Alternatively, you can use a ripping and converting software such as AVS Video Converter to convert the playable DVDs we make into editable files. The resulting files will not look as crisp as the uncompressed .avi or .mov files we provide, and conversion time may be lengthy depending on the speed of your computer. See our Movie Film Transfer FAQs for more information! hard drive space in an uncompressed .avi format at 720x480 resolution. 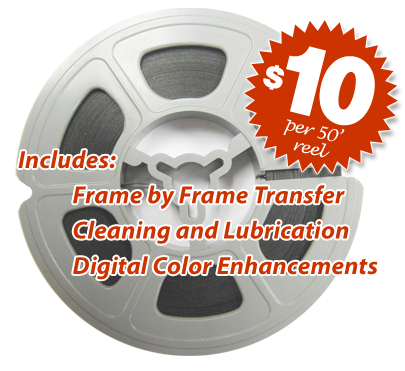 That's just 25¢ per foot for a 1080p HD Frame by Frame Transfer with professional, manual color correction by our videographers! Questions About Transferring Your Movie Reels? •Video Tape Transfer Why Choose Us?